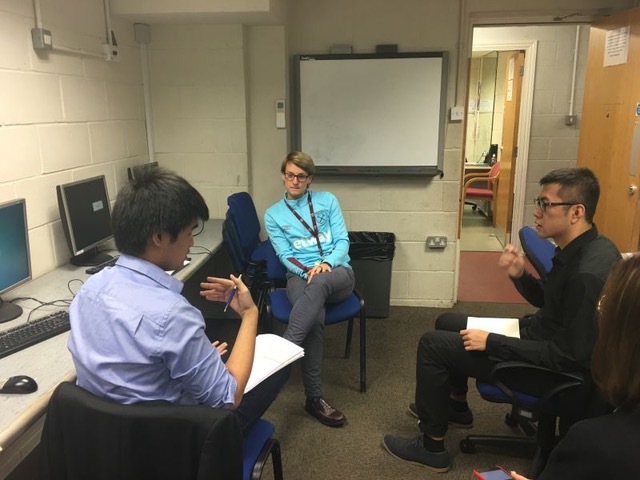 Anak Na Bangxang, a Sport Business and Innovation student documents his Collaborative Project group visit to their project partner, West Ham United Foundation, at their office in London. Anak’s team were tasked with the brief: What value does West Ham United Foundation provide to West Ham United Football Club? and they visited the organisation to learn more about the organisation and their activities. 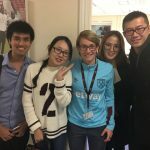 As a Sport Business student, any chance to visit a sport-related organisation is always intriguing, so when I found out that my Collaborative Project team were partnered with the West Ham United Foundation, I was excited and eager to rise to the challenge. In semester one, we had that chance to visit their offices in Beckton and gain a greater understanding of the organisation and their programmes. The Foundation is a separate entity to West Ham United Football Club, but works with them to engage with the community and the youth programmes in London. The Foundation has many programmes, both operated solely by the Foundation and also partnered with The Premier League. Their offices are not only for administration duties but also their football programmes which take place on their pitches. My Collaborative Project group decided to focus on the Foundation’s Girls and Women’s programmes with the aim of getting 14 – 25 years old girls to play more sports, especially football, as part of our project. After arriving at the Foundation, Emily Hayday, the Foundation’s Higher Education Senior Development Officer and the representative of the Foundation for our collaborative project, introduced us to everyone in the team. As our group had already decided on a certain brief, we had a chance to sit down and interview the Women’s First Team Coach, Karen Ray. 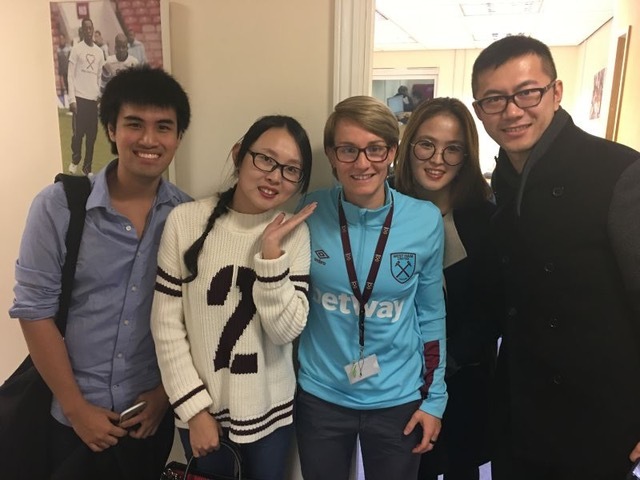 Karen has dedicated a great deal of time to the Foundation and Football Club as she is also an ex-footballer who played for the West Ham United Ladies team. The interview with Karen Ray was very interesting, insightful, and certainly a once-in-a-lifetime opportunity. The questions started on her role, the success of the programmes,and moved to indicator(s) of success and how the programmes can be expanded or improved further to influence more girls to participate in sports and possibly choose sports as a professional career. There were a great deal of very interesting facts that Karen revealed to us which helped shape our final project.For example, that the club have doubled their initial hopes of getting 250 girls participating in the programmes, as they now have approximately 500 girls involved. Before our interview, my personal perception of Foundation and the Girls and Women’s programme was that there is a main focus on youth and recreational participation only. But afterwards, it was clear that these programmes play a large part in the development of the newly-integrated West Ham United Ladies team and the community. Karen Ray also pointed out that one of her favourite aspects of being part of the Foundation is that she is not ‘just a coach’ but she is also a ‘positive influence’ for the girls. She believes that one of the most important objectives of the programmes is to get the girls off the streets and encourage them to pursue better options, such as sports. She also indicated that there are many ways to judge the success of the programme, from the general numbers for participation and schools reached, to the technical evaluation of how the programmes have helped improve a girl’s football skills and the possibility of them playing for the Ladies team. After my interesting visit to the Foundation, I can see that the Foundation genuinely care about the community and are looking to bring programmes to the more areas around London. As a football fan and a sport student myself, it was very comforting to see that the Foundation are trying to ‘give back’ to the community and are using their power and presence to benefit the community. It was also an eye-opening experience to see the running of a sporting organisation, and to meet and talk with people in the industry. Finally, it gave me great pleasure to hear about the success of these outreach programmes and see that there are many opportunities that the Foundation can look into in order to improve and expand their excellent programmes further. Thank you to Anak Na Bangxang, a Sport Business and Innovation student at Loughborough University London, for writing about the Collaborative Project. Credit to Anak for all the included images. To find out more information about the West Ham United Foundation, visit their website.